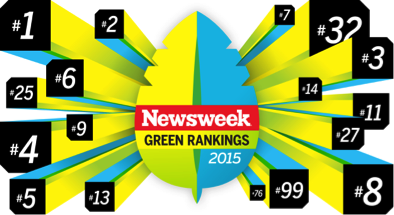 The Newsweek Green Rankings are a globally renowned annual listing recognizing sustainability and environmental impact practices among the world’s largest publicly traded companies. With the Green Rankings for 2015 being released last week, Constellation is proud to announce that its parent company, Exelon, had another exemplary showing this year. In 2014, more than 98 percent of the approximately 37.9 billion gallons of water used by Exelon-operated facilities per day was directly returned to the source. 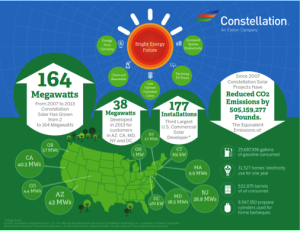 In conjunction with subsidiary Constellation, Exelon is the nation’s 12th largest wind energy producer and a major developer of solar energy. In 2014, Exelon was named to the Dow Jones Sustainability North America Index for the ninth consecutive year in recognition of its strong sustainability performance. Exelon was named in 2014 to CDP’s S&P 500 Climate Disclosure Leadership Index for reducing carbon emissions and addressing climate change. In 2014, Exelon increased its companywide-recycling rate to 69%. In 2014, Exelon helped customers save more than 7.6 million megawatt-hours of electricity through energy efficiency programs. How Are the Newsweek Green Rankings Scored? Audited Environmental Metrics – A “yes/no” evaluation point that determines whether the company had certain environmental metrics audited by a qualified third party in the previous year. A more in-depth and technical breakdown of assessment methodology can be found here.